Back in 2010 twitter was taking off, and there was a real art to constructing a witty informative tweet in 140 characters. Part of that art was using URL shorteners. I wrote about them. Pretty soon after I wrote about them companies started using them automatically, and there were URL unpackers – so you could see what you were clicking on and avoid clicking on a dodgy link. So twitter used t.co as a URL domain root, making life on twitter easier. Last year Twitter doubled it’s character limit, and excluded URLs and Hashtags from the count. URL shorteners still exist but they seem quaint now, I haven’t used one in years. It seems funny to think of the effort that went into some of those early tweets. So you’ve only got 140 characters to write wittily and get your point across AND you have to add a URL!? The simple answer is to use a URL shortener, but which one? There are a lot to choose from, bit.ly, is.gd, tinyurl.com to name a few. Or perhaps you’d like to build your own as Coca Cola have done. It needs to do more than give you short URLs, it needs to be fast and it needs to be reliable. 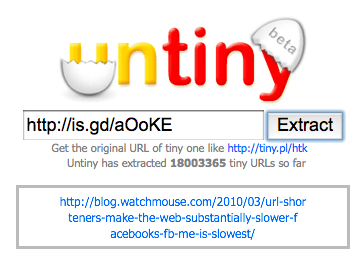 Now there’s a way to monitor which URL shortener is the most reliable thanks to Dutch company Watchmouse. So far today all those monitored are operating normally, but in a full month’s analysis the company found that Facebook’s shortener was the slowest by far. I use shorteners for posting on twitter, that last URL to lifehacker is 93 characters long, the one to Watchmouse’s blog is 111 characters, leave no room witty commentary in a twitter post. Is.gd took both to 18 characters leaving me 122 characters in a tweet. If something is modular more pieces can be added to it, or replaced, yet the thing still functions. Think of lego bricks that can be used and reused to build everything from a pirate ship to the Death Star to an the Art of the Brick. Some companies have made a business model out of this, it is exactly how Fairphone have designed their phones to be made up of interchangeable, replaceable, components. Very often traditional communications departments separate teams by the audience, so you have media relations, internal communications, external communications, investor relations, sustainability, corporate branding. Each team produces their own content, even though the stories have the same facts behind them and need to be somewhat consistent. Modern communications departments are transforming and the new approach is called a newsroom approach, where all potential stories are discussed and assigned to a communications expert – a reporter – who is responsible for the creation of all the content relating to the story for all audiences. So one person might lead the production of a short video interview with an expert and a post for the company’s internal collaboration platform for internal audiences, a press release for the external channels, and an FAQ for media enquiries. But lots of content is evergreen, meaning that a manufacturing company knows they’re going to say something about safety every month, a consumer brand knows they’re going to campaign around father’s day every year, and a listed company knows there will be quarterly reporting on company performance. So what if we turned the content around and produced assets that could be combined into content, essentially content becomes data. There’s a line in Steve Krug’s excellent book “Don’t make me think” that talks about creating content. Someone stole borrowed my copy so I’m going to misquote him… “we write content for the web like we’re creating great treaties, but people read our sites like they read billboards on the highway”. Content that gets consumed easily is short and clear, content that gets shared is short, clear and visual – we need to build that into our content plans. The only way we can do that and meet the ever shrinking timelines for content generation is to take a modular approach and build teams around skill-sets rather than audience. Think of your content in micro chunks and build up from there. Think of your company’s top five products or services and the need they answer and build infographics for those needs, but leave the text editable (use Canva, it’s cheaper than photoshop and your team can collaborate). Think about how your modular content could then be repackaged into a presentation, or an article, or an e-book. Think of how much easier it would be if you were building up a warehouse of re-usable items, rather than a library of articles. Using social media creates a content monster that needs to be fed. In most organisations a lot of thought and planning goes into the concept, design and development of content. Today’s post is a framework for building that content plan. I am focusing on social media, but the principles of building this plan work for other types of content. Think about your content in terms of layers. Content can be broken out into three types; evergreen, events and spontaneous. Each requires a different approach but when used together will increase the impact of your social media presence. Sometimes also called drumbeat content, evergreen content can be planned and developed ahead of publishing. Think more broadly than company specific dates. For example Philips, manufacturer of X-ray machines, posts on Marie Curie’s birthday. If you’re running a campaign on a specific product build brand content that supports your campaign message. For example, if a bank is running a campaign around savings products then the brand content could include articles on the psychology of saving. Use a specific rhythm to activate one idea. For example there’s a “Meatless Monday” trend in certain healthy circles if you’re a food company you could use this and promote vegetarian menus every Monday. Alternatively use a series of longer articles to go into depth on a specific area of your company’s expertise. Research relevant dates for you and determine which themes/ series you want to build on. Develop quality content, which means spending on design, photography, writing or filming the content you need. Don’t be afraid to re-use this content, either posting highlights onto twitter/facebook, or repurposing it for other platforms. Keep cultural differences in mind, not everyone celebrates the same thing, in the same way, or even on the same date. (Mother’s day is widely celebrated – but not on the same date). There are already a number dates to use on social media; those company announcements, conferences, events and campaigns that your company attends or produces. Product launches are known months, or even years in advance, adding brand content to support the launch can increase the impact of the campaign. Company leaders attend and speak at events throughout the year, decide which of these would be of more general interest, take any “infographic” or suitable images from presentations and re-use them on social media. 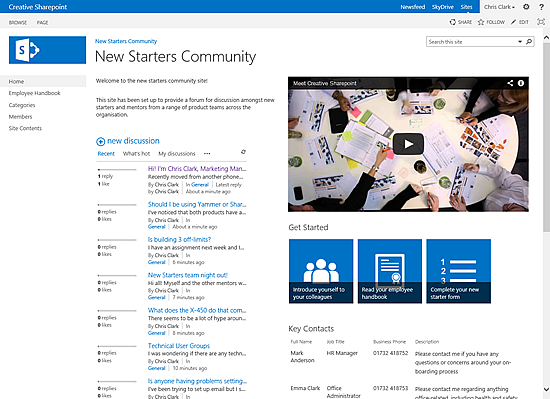 Add the known events and campaigns to your calendar, include the event/campaign contact person. Work with the event/campaign lead to develop content that supports their plans. Use a simple hashtag for your own event/campaign and encourage a wider audience to publish under it. Your company wins an award, there’s the announcement of a merger (or divestment), you’re finally in the ranking you’ve been working towards, you hear of an significant date that matches your company’s portfolio – on the date itself. Every content team I’ve ever worked with has “last minute” content needs. So while I’m a big fan of planning ahead you also need a little flexibility to take advantage of these opportunities. Prepare likely potential images for your asset library, eg relating to awards ahead of time. The more diverse your asset library is the more likely you are to have a suitable image to hand. Use your social listening tools to monitor awards in your industry, and watch for the announcement of relevant rankings. Maintain good contact with the colleagues who handle last minute announcements. Explain to them that you don’t need to know the content of the announcement which may be confidential, but if you know the timing and the sort of content they’ll need you can work with that. Encourage their input into the asset library to build relevant assets. Putting the three layers together we can see that the impact of your content, whether measured in exposure or share of voice, increase when the layers are combined. All three forms of what does a content calendar need good planning to be successful, but how far ahead to you have to plan? The honest answer is “it depends”. For this blog I have a plan that’s about 2 months ahead, with a content deadline of about a week before publication. But that timing needs to change if you’re collaborating on content with a team or you have approval steps needed. Large organisations are more likely to have deadlines further ahead of publication and the plan for content themes is probably running 6-12 months ahead. Making that “Spontaneous” category harder more important in order to stay relevant. I use a google calendar, I can look at anywhere, on any device, I can add assets and links as I go. But my blog drafts are written directly into wordpress (not best practice). That works for a one person company and would probably scale up to a small team. For large companies there is an amazing array of sophisticated tools on the market. They enable planning and collaborative development of content, publication, sharing/editing of posts and assets, and reporting on content performance. None of this is that hard to work out, but maintaining quality content requires a rare combination of creativity and discipline, with a dash of flexibility to take advantage of those out of the blue opportunities. We’re often encouraged to look for the “win-win” outcome, or a situation will be described as “win-win”. Generally it’s used to point teams to look for outcomes where all parties will benefit. It’s common parlance now but it comes from game theory, specifically from “non-zero-sum” theory. That is a game some outcomes have a total greater or less than zero, best illustrated by the prisoners dilemma. Imagine that two prisoners can either betray the other or remain silent with the following potential outcomes. Rationally prisoners will betray, since that gives them the best outcome when they don’t know how the other will behave. Which gives you an indication of how hard it is to get to a win-win situation between two parties with competing interests. In addition the win-win should be a new solution that delivers positive outcomes to both parties, in practice a compromise can be called a win-win when it delivers less to each party and is in fact a lose-lose, but with both parties losing less than in a dual defect situation. Given that there is a rational advantage in defecting, and often in defecting early, it can take tricky negotiation to get both parties to co-operate. Perfect subject for a Friday! Cyberslacking refers to the use of a company’s computer and internet connection for personal activities when one should be doing work. It’s not the occasional email, or lunchtime Facebook status check that’s deserves the name, it’s the excessive use of work time to play on the internet. Those times when you look up one little thing and 30 minutes later you’re in an internet black hole arguing, or buying another light sabre or watching cat videos. And of course mobile phones make it even easier. It’s not a new thing, as early as 2000 reports flagged the cost of lost productivity as more than 50 billion USD in the US. The same report notes that companies were already taking action, putting in place specific internet use policies and firing the greatest violators – such as employees spending as much as 8 hours a day on gambling sites. More recent estimates put the costs to a business at 35 million per year for a company of just 1000 people, if each employee cyberslacked for an hour a day. Some companies see this as a loss of productivity, effectively money down the drain and seek to monitor or to limit access to all non-work internet sites for all employees. Employees find their own strategies; blocking access on work machines means they’ll use their own devices, trying to watch over their shoulder leads to cheeky solutions like the “look busy” button on Last Minute’s Australian site (it used to be on more of their sites, but apparently only the Australians kept their sense of humour). There is some research showing that people who take internet breaks at work are more productive. I’m inclined to agree, if people are busy with meaningful work and producing great results, brief internet breaks are not going to cause a dramatic drop in productivity. In fact if managers focus on results the fear of productivity loss goes away. This holds true even in extreme cases; the guy playing on online gambling sites all day is unlikely to produce the expected quality of work – addressing that issue early could have a better outcome for both the company and the employee. This focus on results is one of the key principles of the Results Only Work Environment (ROWE), in fact in a ROWE the time spent on the job becomes irrelevant, employees are trusted to use their judgement to plan their workdays. In my view it’s a much healthier than putting increasing layers of monitoring on employee’s use of internet. I guess I’m in favour of mild cyberslacking. Companies are using digital platforms to connect with their consumers and/or employees. So whether it’s via an internal enterprise social media network or a Facebook page building engaged communities has become more important. 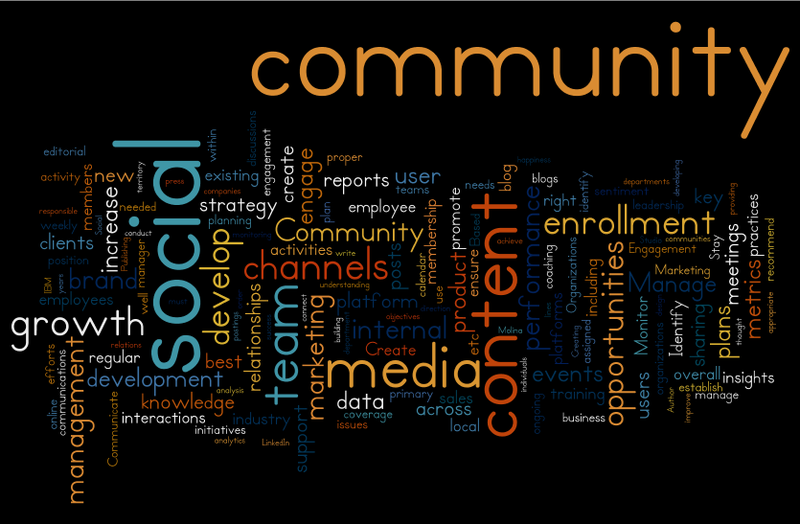 What would an engaged community look like? Lots of people active in the community and some productive outcomes. What constitutes a productive outcome depends on the community’s purpose, it might be questions answered in a support community or successful idea generation conversations in a strategic community, or money generated in a crowd-sourcing community. Your community should have a strong sense of purpose, you might even state your community’s purpose right on your front page. Communities without a purpose suffer one of two fates; either they shrivel and die, or they become social only – virtual watercoolers. In one company I know of the most active community was one where employees discussed their pets. I’m a fan of pets, but I doubt the company built a enterprise social network to facilitate this discussion. You need to feed the community with content. 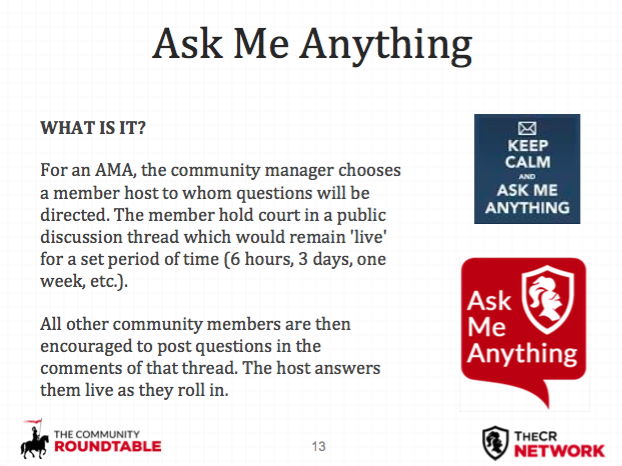 The Community Roundtable identified five great ideas for content and programmes. Notice anything? All these examples explicitly call on the community to participate. Download the free e-book from the Community Roundtable for ideas and examples on making all of these work. The best community managers make it look easy; from welcoming new members, answering questions, modelling the behaviour of the community, solving any issues and providing the content and programmes to serve the community and build the purpose. It takes a particular kind of person to do it well. Sprout Social has made a good distinction between the roles of social media manager, who functions as a brand representative for a company, and a community manager who champions the purpose of the community. Community managers who build engaged communities can share their expertise in their own communities, and need to be rewarded for their expertise and the care they take. You’ve got a Facebook account, you know your memes, your CV is on LinkedIn. A colleague of mine once told me that everything you put online is public and permanent, and if you’re averse to risk you may have avoided building up a social media presence. But at a certain level it’s almost a job requirement, as part of your personal branding. So how do you create a professional online social media presence that survives scrutiny from your boss, new colleagues or your future partner? We’ve all created accounts and then forgotten about them. I had a very confusing time trying to use Flickr at one point as I had somehow created two accounts with very similar names. So check your existing presence. what work business can you discuss; I was once asked to take a post down because I had implied poor governance over our company’s intranet, the truth was no defence. Since then I’ve avoided explicit statements about where I work. With the information from these two things done you are ready to start setting up your social media presence. How many social media platforms are there? No body knows, I found an article from 2010 listing 57, and the first one doesn’t exist anymore. Another article from last year lists 20 including Vine which resides in the internet equivalent of a hospice. So you’ll need to to research which ones work for you. Think about the size of the platform in your market(s), the type of content you can create to share, and where your audience is. My strong advice is to pick one or two to get started and do those well before taking on more. Here is a summary of the biggest platforms. Facebook Unless you’re in China or Russia, or have a very niche business you will need to be active on Facebook. Population Almost 2 billion users (April 2017). Demographics 80% of internet users are active on Facebook and it’s the most popular social media site in most countries of the world. You can have a personal page in your own name, and a page that represents your company, your interests or your community. YouTube Everyone consumes content on YouTube, relatively few people create content. But if your company can find a content niche you can win viewers, customers and PR pages, like the “Will It Blend” channel. Population About 1 billion users (April 2017). LinkedIn Although this has a lower total population check its reach in your country and industry. For finance professionals in the Netherlands at least 80% are on LinkedIn, so if you want a professional social media profile as a financial expert here you will need to be on LinkedIn. Population About 106 million users (April 2017). Demographics Roughly equal on gender, slightly older overall audience, skews towards higher education and professional occupations. LinkedIn works of a personal profile, allows shared content, and offers company pages. Population Almost 319 million users (April 2017). Demographics Very general user base, even split on age, gender and education. I like Twitter (follow me @changememe), it’s like being at a conference during a break. But unless you’re following a range of interesting people there it will seem empty. Instagram If you’re all about the images then Instagram is the highest audience sharing platform. Population About 600 million users (April 2017). Demographics More women than men, younger audience. Content types images and short video supported, with new tools all the time allowing stories, boomerangs, mosaic, and portfolio posts. I love Instagram, and post at least one photograph from amazing Amsterdam every day, but if you’re not able to produce visual content every day this may not be the platform for you. Snapchat et al Auto-delete platforms are the rage with the kids (yes I’m old) and they are fun. Some companies, with a focus on millennial audience, have been making progress, if your brand is in this area you might want to play with his in the mix of your personal social platforms so you really know how it works. Population About 300 million users (April 2017). Demographics Even split on gender, younger audience, lower education level overall (due to lower age demographic). Content types images and short video supported, with stickers, faceswap and image distortion options available. Blogging Do you have a lot to say? Blogging is the way to go for long form text content. There are loads of platforms out there, this blog is run on wordpress, which powers about a quarter of internet sites. I also occasionally post on the LinkedIn content platform and on Medium. There are a slew of platforms out there, take time to look at the functionality (is it easy to write and easy to share your content? ), audience building, and robust (will the company survive with your content?) before choosing one. I’ve used WordPress for about 7 years (having imported it from Blogger) and still like it, every so often I look at others. Your profile consists of your name, your biography, a photo and, in many cases, a header image. These should all reflect you and be consistent. Each platform offers you options to write a short biography, add a photo and, in many cases, a header images. The descriptions should be consistent, and the profile image should be the same headshot. A word of warning about twitter bios, you have a 160 character limit, but only the first 110 are visible in search results, so put the good stuff first. You want to build an audience, decide who you will follow and follow back. Be aware that some platforms have limits in place, Twitter puts ratio limits in place when you follow five thousand people, and Facebook has a limit of 5000 on friends (although more can follow you. I recommend; follow those in your field of interest, who have genuine accounts. Search for these on individual platforms or based on blogs/websites of experts you’re interested in. I use StatusBrew to manage twitter followers as it helps me identify people who don’t follow back or unfollow me, I want my ration of followers to following to stay at about 1, and this helps me manage that. You need to pick a sweet spot of subjects to write about; where you are passionate, can be useful and credible. You might be tempted to write about everything, try to narrow it down to a core subject area, this helps your audience know what expertise they can get from you. You can break out of your core subjects occasionally if your passion overtakes your logic; I write about digital, communications and innovation, but have broken out occasionally even to politics which I never thought I’d write about. The next step is to think about your content calendar, social media is a hungry beast and you need to find manageable ways to feed it. One way to help is to connect your accounts to automate publication, when this blog post is published it will automatically land in my Twitter, LinkedIn and Facebook accounts. Technically the best practice for social media is to build content specific to each platform, but out here in the real world cross-platform sharing is a sensible approach. Social media on a personal level can build your personal brand, and build your credibility as an expert in your chosen field. I’ve had an invitation to speak at a conference via twitter, a freelance gig via Facebook and via LinkedIn? Still waiting for the job offer.